"It's obvious the beer is good, ever try wine.....I bet your wedding party will be a kegger...."
Monday evening was the kick off of our Co-Ed Softball season and we started out with a huge win! 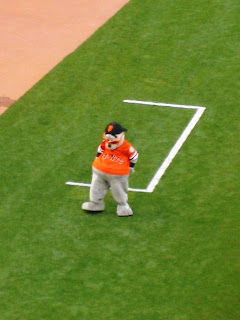 Finishing the game in the 5th inning 14-1. Wow. 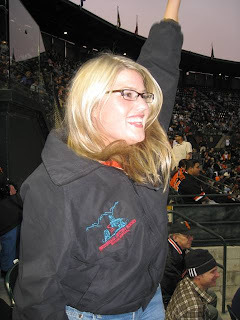 If this is an indication of what is to come Hollister may have to start a minor league just for us! 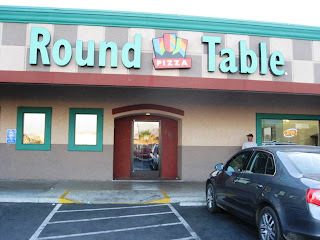 Anywho, we needed to refuel and rehydrate so we did what any team would do fresh off a win, go to Round Table Pizza located at 496 Tres Pinos Rd in Hollister. 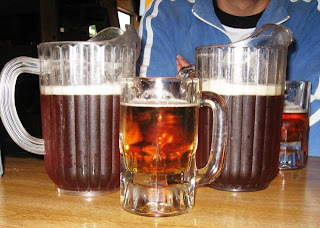 As we wait for our pizza to be cooked we order a few pitchers of beer and some appetizers. 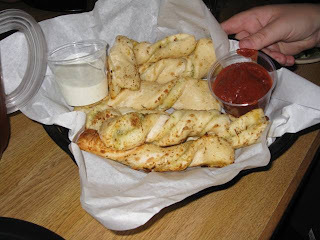 The bread sticks were ordered by Nina and at first did not pass her strict qualifications she has for bread sticks. They were a little rare to her liking. So they sent them through the oven for a quick trip and came back ready to rock and roll. 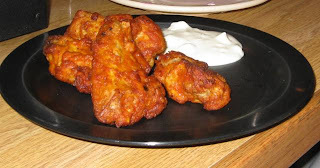 The marinara sauce and ranch combo make a delectable dipping sauce for anything to bathe in. The Chicken Wings were also a big hit! I enjoy how they are not "in your face" hot. In fact they are savory versus fiery. Makes eating a dozen a lot more pleasant, which is more other places can say. Between our team we split three pizzas - the Montague's All Meat Marvel and two Pepperoni and cheese. 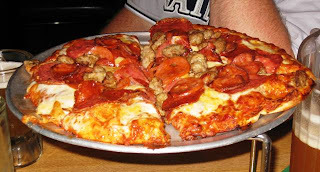 The All Meat pizza is made up of four deliciously seasoned meats, those being: Italian sausage, pepperoni, Italian dry salami, and linguica. It is then baked off with a blend of 3 cheeses on our Zesty Red Sauce. I enjoy the Zesty quite a bit, they could have been more generous with the sauce because it really is that good! The Pepperoni and Cheese were both cooked to perfection. An extra portion of pepperoni were snuck onto both pizzas, it most have been our lucky day! Oh wait, it really was! Overall Round Table was a great dining experience. How could it not have been? Great food, awesome friends and the excitement of winning the big game all were combined into a wonderful evening. I give Round Table the official two thumbs up! Go down and check out the salad bar, not everything is drenched in meat and cheese - there is something for everybody! Can I get a hoorah for AB's Wrecking Crew?! HOORAH!!! 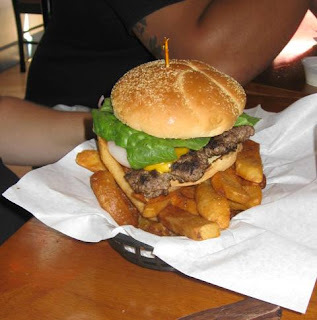 On Friday after work I met up with some friends and decided to do a review of Cheap Seats Pub and Grub located at 427 San Benito Street in historic, downtown Hollister. I was a slacker with my camera and did not catch the decor or the facade. 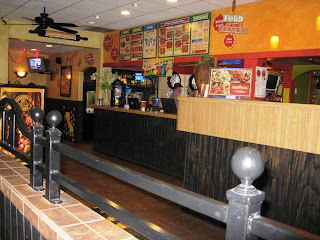 But I am sure I will be back to review this place in the near future. Now, on with the food! 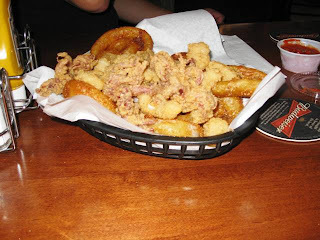 I had the Fried Calamari with Onion Rings and it just so happened to be the special at Cheap Seats on Friday. There was an equal combination of rings and tentacles. It was your standard batter-coated, deep fried squid, fried quickly preventing it from becoming too tough. It was served plain, with salt and marinara sauce on the side. Greasy, yet delicious. Did not finish the basket or for that matter even put a dent into it. 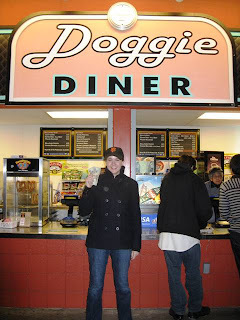 Next up was the famous Cheeseburger that Cheap Seats has become known for. It looked great! It was huge! The toppings looked fresh, the fries looked like they were cooked well done but, that is how I like them - a little crisp. Look at this beauty! 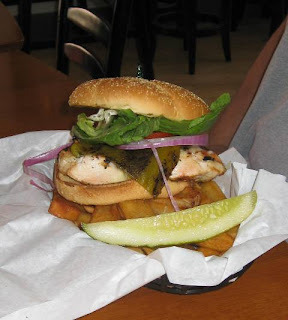 The Grilled Chicken Sandwich was also large in size. All stacked up and ready to munch on! Looks great. And healthy too! Other table orders were Hot Wings and Nachos. 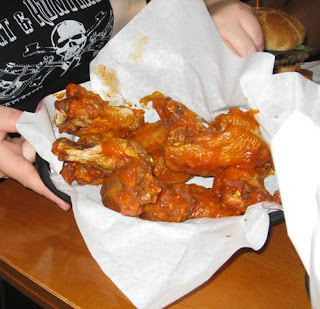 The Hot Wings are great. Very addicting but the garlic taste consumes you after awhile. Not recommended date food. The Nachos are what they are. Artificial cheese. But oh so good. Eat them while they are hot because once they are cold... have the waitress take them away. The flower guy comes by! Roses for $5 is a score! 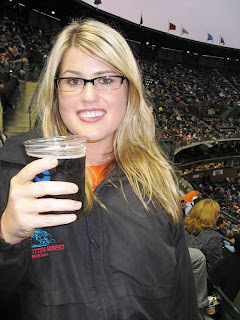 All and all Cheap Seats is a great place to meet up with friends for a casual night out. Drinks are a plenty and the food is satisfying. Not necessarily easy on the waistline but for a treat, it does the job well. 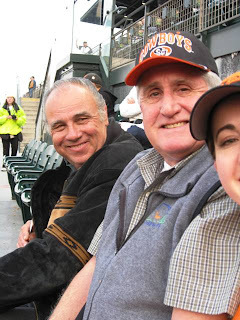 I am sure this won't be my last trip to Cheap Seats. You will probably see me there after our softball team, AB's Wrecking Crew, wins the championship again! Boo-yah. It needed some spice! 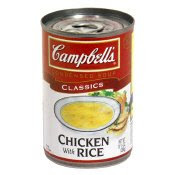 I wanted to jazz up the good old fashioned soup a bit. I poured the soup into a large bowl and sat down to enjoy my lunch. I took a few bites and realized it was missing something. What? I am not sure. So I stand up and start to wander through the kitchen... and then a light bulb went off!!! 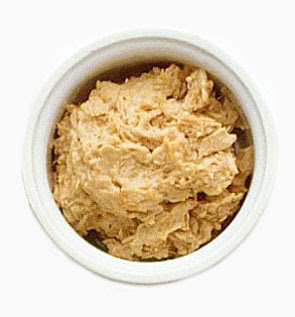 The tuna salad mixture that my grandma made for sandwiches was still sitting out on the counter! So, I just do it and mix the tuna, mayo, sweet relish mixture into the soup! I don't even think twice and boy, I am glad I did not! This little experiment was a home run. I am not sure what i am going to call this miracle invention but I sure it will be somewhere along the lines of "Creamy Dreamy Tuna and Rice Sumpremy". That sounds great if you ask me! I am not sure how exactly all the flavors come together but they just do. 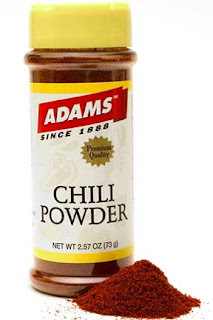 If you don't believe me, just try it yourself and you will instantly be amazed. Just do it! 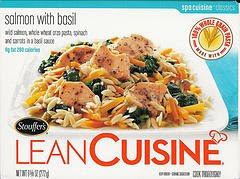 Lean Cuisine says: Wild salmon on a bed of whole wheat orzo pasta with yellow and orange carrots and spinach in a basil sauce. Melissa says: I like seafood. A lot. I like it prepared in every way imaginable (yes, that includes raw!). But frozen fish worries me. This however is one of the instances where I am glad to say that I was wrong, wrong, oh so wrong. Once cooked, the salmon in this dish is tender and moist, and has very little of the nasty ‘fishy’ flavor/smell that is so often present in frozen fish. Once you separate the fish with your fork and mix everything together, there’s plenty to go around. Even though the veggies are limited to carrots (yellow and orange) and spinach, there are plenty of each. The spinach is cooked, but not slimy, and the carrots maintain their somewhat crunchy texture. The sauce is fantastic, though if you don’t like basil, you probably won’t care for it. I was pleased with how well the flavor accented the fish and vegetables. I’m not sure why orzo pasta was chosen to accompany this dish, but kudos to whoever thought it up! This small, tender pasta soaks up the sauce well, and does not overpower the dish. Overall, this meal has become one of my ‘standards’ – something that I know I like, and purchase on a regular basis. 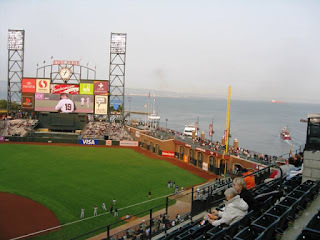 So as you could see we dined on AT&T Park fare. 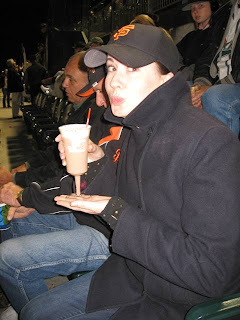 It tasted good because we were at the ball game and were excited about being there. 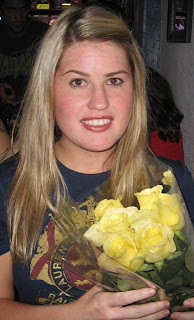 I ordered the Grande Nachos because I love jalapenos - the chips were a little stale but the cheese made up for it! 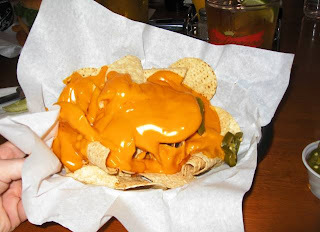 Dip anything in nacho cheese and it will taste great! 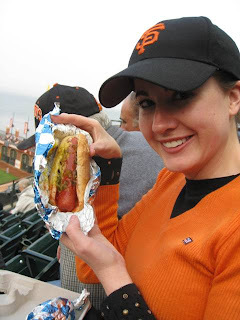 Jennifer, my dad and uncle all had Giants Dogs with all the fixings. Two large cokes and a Miller Light washed the meal down. 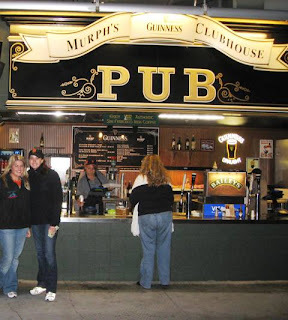 Towards the 5th inning Jennifer and I were in need of another liquid snack so we wandered on down to the Irish Pub and sampled a Smithwicks and an Irish Coffee. Very good. 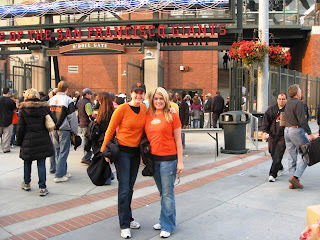 On our way back to our seats we decided next time we will stick to those ever so aromatic Garlic Fries and the Clam Chowder found on the Promenade. 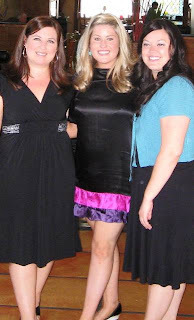 Between the 4 of us we spent $80. Pretty typical. The game couldn't have been better. 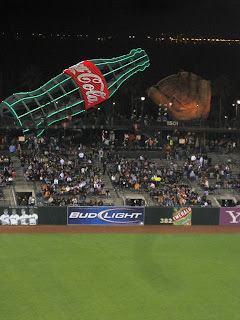 Bengie Molina hit a two-run homer and a solo shot, Barry Zito won his second straight decision and Omar Vizquel added an RBI double. 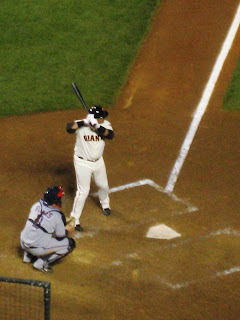 Aaron Rowand's RBI single in the eighth provided an insurance run. 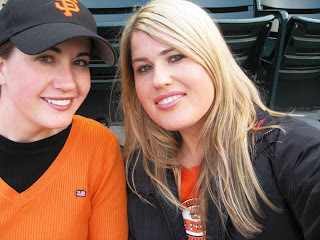 My sister and I would like to consider ourselves the good luck charm that the Giants needed last night! 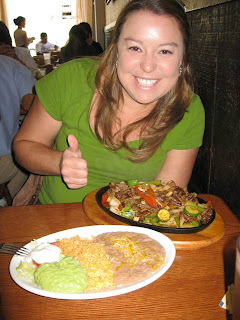 One of my loyal blog readers asked to go to lunch and help review with me! How great is that? 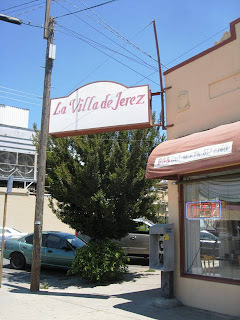 So, April, my new cousin in law, and my cousin Todd decided to wander to 905East Street to eat at La Villa De Jerez and smell the wonderful aroma of the cannery in full swing! Upon arrival we were greeted and brought a fresh basket of chips and some tasty salsa, of which has avocado diced through it! Tasty! After eating what seemed like mountains of chips I was starting to get full and needed to order! April's Fajita de Res came out first. As you can see it was a massive feast. The steak appeared to be perfectly cooked and vegetables were a plenty! A nice mixture of onions, bell peppers, zucchini made a nice medley for burrito assembling. 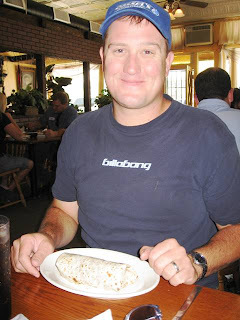 Next came Todd's burrito. 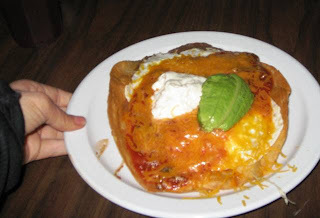 It was a mixture of carne asada, beans and I think cheese. He said next time he might just order it with all meat... you live and learn. Mine came out last, but it was okay... I was full from all the chips and salsa. 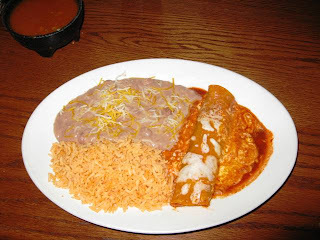 The shredded beef enchilada made with a corn tortilla was quite tasty! There was plenty of cheese and sauce making it perfect to mix in for some tasty bites of rice and beans. My only beef, haha mind the pun, is that the shredded beef was a little dry. Overall the meal was pretty good. The price was affordable, $31 for 3 people is not bad at all. 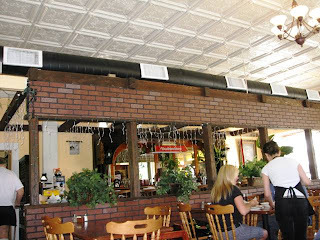 The tin roof ceiling is very neat, I like the feeling of the old building - gives me good vibes. The hum of the cannery is also a nice touch. 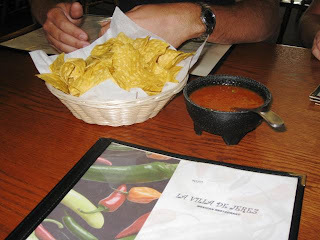 For the price, friendly wait staff and cool tin ceiling I give La Villa De Jerez 1.5 thumbs up! Monday is always a crazy day and they say breakfast is the most important meal of day. I skipped breakfast this morning so I figured why not have it for lunch?! 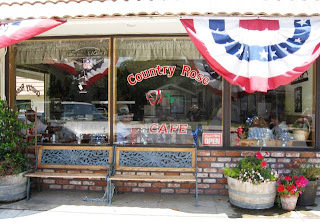 So I picked up my ever so loyal food reviewer, Amanda and we made our way to 696 4th Street in downtown Hollister to visit my friends at the Country Rose. 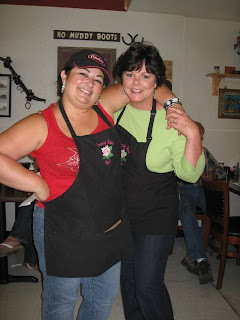 We were greeted by one of the owners of the Country Rose, Sharon Baker and the 2x Free Lance voted Best Waitress Suzie Fretias! How lucky were Amanda and I? 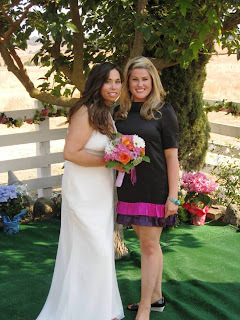 We have both been to Country Rose many times so we both pretty much knew what we wanted and knew breakfast was on the mind! Amanda's Potato Pile came at the same time mine did and boy, did it look good! You know when you go to a restaurant with someone and you get ordering envy... I may have had that today! 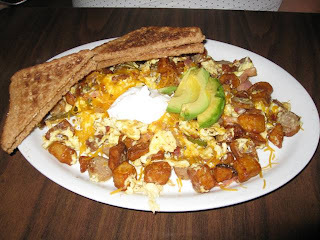 The Potato Pile is a mixture of bacon, sausage home fires, onions, bell peppers, scrambled eggs all covered with cheddar cheese and topped with sour cream and avocado. WOW! This is a Country Rose favorite! 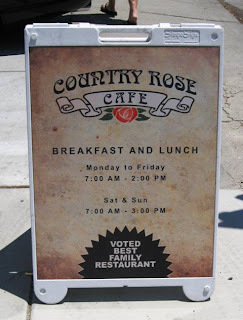 The Country Rose not only serves great breakfast but that also have an outstanding lunch menu as well. 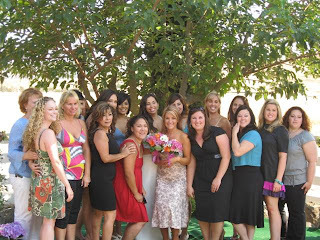 I would also like to point out they are very active in the community and are Chamber members of San Benito County! So, remember if you want to see a friendly face, along with real food head on down to Country Rose. They will be happy to see you! Two thumbs up from me! I ordered the Sampler. Do notice a trend in what I have ordered lately? Lots of fried food - I seriously need to break that habit. I need more vegetables!! Anyhow, back to the the Sampler. 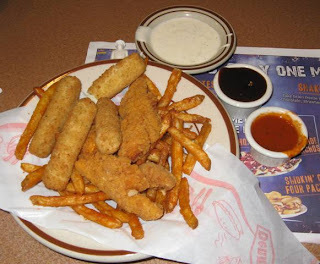 The Mozzarella sticks were nice and hot, pretty standard tasting. The chicken strips were good but the barbecue sauce is what really made the meal! Very tasty. The seasoned fries had a nice crunch. Overall nice... How do you screw up fried food anyway. I promise I will order more healthful next time. 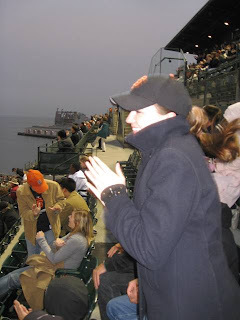 Jennifer debated between the Super Bird and Moons Over My Hammy. I think she wanted the Super Bird all along but just liked saying Moons Over My Hammy... :) So the Super Bird came and it looked just right. For those of you not familiar with the Super Bird it is thinly sliced turkey breast with melted Swiss cheese, bacon strips and tomato on grilled sourdough. Jennifer also asked for the barbecue sauce on the side... we both liked it - I wonder what brand it is? All in all Denny's was a pleasant experience. I mean for a late night eat it filled our belly's without breaking the bank. 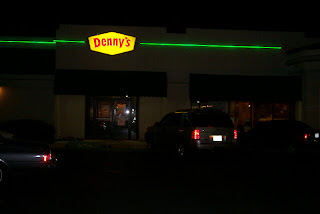 I give Denny's in Salinas 2 thumbs up for friendly wait staff, quick service and hot food.